Rogues' Castle is a castle inhabited by rogues in the far northeastern part of the Wilderness. It is a very quiet place with very little to do. However, that doesn't stop it from having a visitor once in a while! This castle is also members-only. Warning: All entrances may risk coming in contact with the Chaos Elemental (Level: 305). Also keep in mind Revenants could very well attack you. 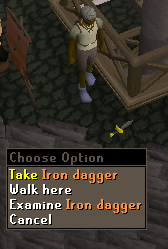 A common method for most experienced players of getting this far into the wilderness is by using the lever in East Ardougne. For this method you'll need a weapon or tool that can slash things; a simple example would be a knife. 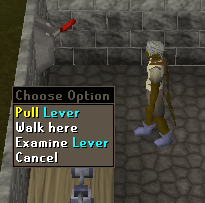 The lever is located in a house next to West Ardougne's wall. Pull the lever to teleport to a peninsula surrounded by lava in level 50+ Wilderness. From there head north and slash the web. Hug the north coast and walk east. You'll pass a small hut and the Scorpion Pit. Once you passed the Scorpion Pit head southeast to the entrance of the castle. 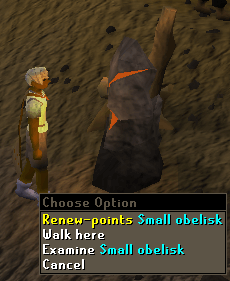 Another quick way of getting there is by using the Wilderness Obelisks. Keep using them until you reach level 50+ Wilderness and end up just east of Rogues' Castle. Simply go east and enter the castle from there. 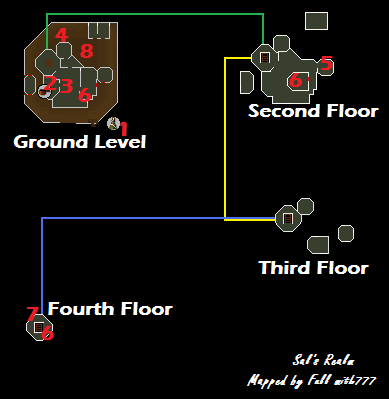 This route involves the most walking, but if you teleport to Bounty Hunter or Clan Wars Games Necklace (8) you can head north and enter the members-only gates. From there head east or west (depending on which gate you went through) and enter the castle. 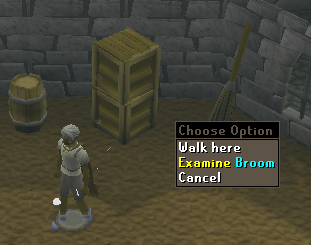 If for some reason you're already at the Mage Bank, you can walk from there. Exit via the lever with a knife in your inventory. 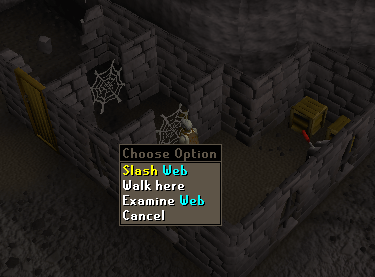 Slash the webs and walk east until you get to the Scorpion Pit. Pass the pit and head southeast to the castle. The entrance will be to the south. The final methods are the most uncommon. 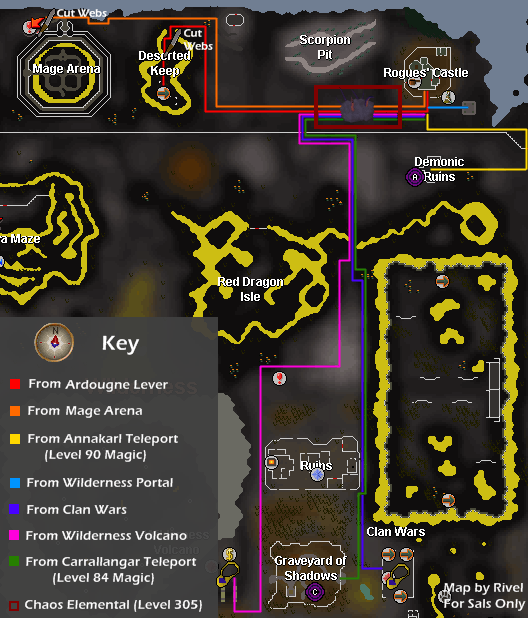 If you have ancients on, and you have 90 magic, you could use your Annakarl Teleport (2 Laws and 2 Bloods) to get to the Demonic Ruins in level 47 Wilderness. From there go northeast to the gate to the members-only part of the Wilderness. Then go west passed the obelisk and to the castle. Also, if you don't have 90 magic, but have 84, you can use the Carrallangar teleport (2 Laws and 2 Souls). This will take you to the Graveyard of Shadows, just west of Clan Wars. Note: Keep in mind that the map above shows the most general routes, not the safest routes. This Summoning Obelisk is placed in the middle of nowhere it would seem. However it may come useful to players who are fighting the Chaos Elemental with a familiar. This may also be used often by players who are using the Wilderness Obelisks and come to the one near Rogues' Castle and want to recharge their Summoning points. 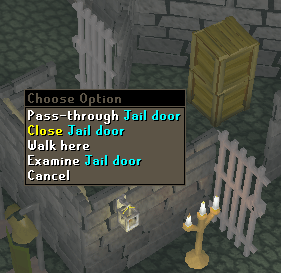 There is a range inside the Rogues' Castle, but no bank in sight. It is unlikely it's used too often. Pickpocketing may be an unlikely reason to come all the way out here, but it is available. 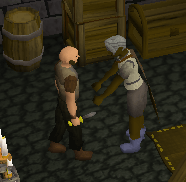 If you have a Thieving level of 32 or more you are able to pickpocket these Rogues inside the castle for 25GP, a Jug of Wine, and Lockpicks. Due to the fact that Rogues' Castle is in a remote location, there is a pair of coordinates that will lead you here. The coordinates here are '24 Degrees 24 Minutes North, 26 Degrees 24 Minutes East'. This will take you outside the castle, but inside the walls to the north. You will dig somewhere between two skeletons. 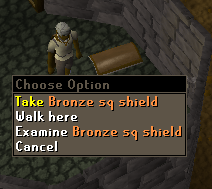 On the second floor of the castle, and the room farthest to the east, you will find a Bronze Sq Shield spawn point. There are three Gold Ore spawn points on the first level of the castle. Now on the second floor of the castle, and in the middle room, you will find a Gold Ore spawn point there. You will also find a Gold Ore spawn point on the fourth floor of the castle. On the fourth floor of the castle, you will find an Iron Dagger spawn point. To enter the Spirit World here, you must've completed the Summer's End Quest. You also will have to have your Jennica's Ring. Then, go to the broom leaning on the east side of the wall of the Rogue in prison. Walk three steps east of the broom. Then wear your ring and operate it. 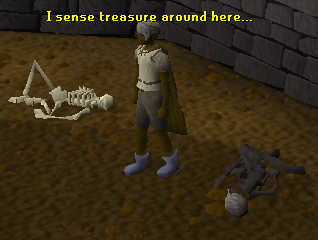 If you haven't visited this Spirit World yet, and you are at least level 60 Thieving, you will gain 10,000 Thieving experience from doing this. You can also free the Rogue in prison (refer to the Inhabitants section). This Rogue is in jail, however, it is possible to free him after Summer's End. To do so enter the Spirit World in Rogues' Castle (refer to the Spirit World attraction). Then go to the jail doors. Pass through the first one and close the one to the north. Then pass back through the first one again and close it. Go back to the real world and the jail doors will now be open. Pass through them and talk to the Rogue. 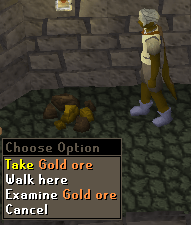 If you agree to free him, he'll buy gold jewelry for market price in Varrock. His house is just behind the Archery Store. 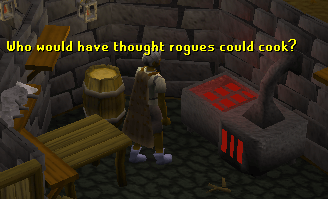 These Rogues can be pick-pocketed for 25gp, a Jug of Wine, or Lockpicks if you have a level 32+ Thieving. They also can be killed for various drops. The Chaos Elemental isn't located in the castle, but is often found outside the walls of the castle. This monster can hit fairly high and has special abilities such as removing your armor.